So last year Spider-Man came out on PS4 and the world rejoiced. It was highly anticipated and reviewed incredibly well. Everyone had to get some of that Spider-Man. I was one of those people who had to get some of that Spider-Man. There was a minor problem for me though: Dragon Quest 11 came out 3 days earlier. For most people this was probably wasn't even a problem. Spider-Man's sales figures prove that. It was a huge problem for me though as I wanted to play both of these games. My desperation for new Dragon Quest won out though, and I played DQ11, thinking that I could get to Spider-Man later. I didn't realize that later would mean 2019. The theme for this months Band of Bloggers was "Looking Back" and so I'm looking back at one of the most antipicated PS4 titles of 2018 that I completely skipped. 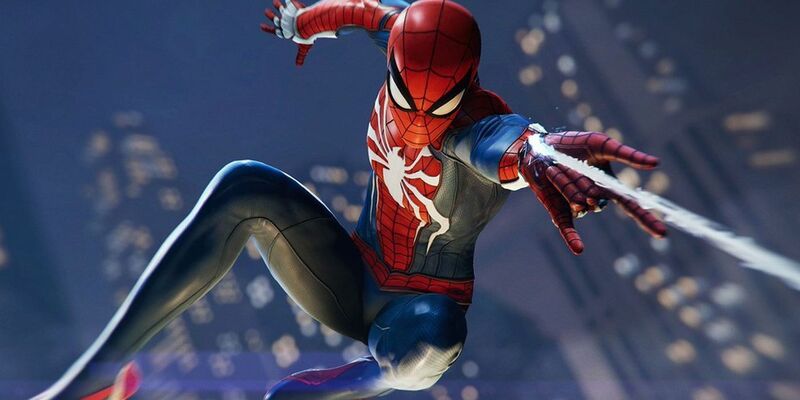 Let's look at Spider-Man for the PS4. So obviously the game is great. Everybody loves it, it's won awards probably. It was nominated for game of the year a few times. It's great, you don't need me to tell you that. I just want to regale you with a story of one of Spider-Man's silly antics. So Spider-Man was just flying around the city like he do when some lady on a roof calls out to him. Spider-Man was of course willing to listen, being neighborly and friendly, and flings himself at her at top speed, somehow not injuring either of them in the process of stopping. This lady is named Stephanie and is worried about some heavily armed men she saw entering the park. Spider-Man of course immediately gives Stephanie his contact info so she can be his eye in the sky, a move that doesn't at all seem like it might be problematic for him some day down the line, especially since this seems to be a very common occurance for him. I think most of the citizens in Brooklyn have Spider-Man's personal contact into at this point, but that's not the point of the story. There are most certainly some goons in the park. Spider-Man takes them out with ease as he isn't playing on a high difficulty. He does so stealthily, webbing them to the ground or walls while out of sight of the others. After webbing the last goon, Spider-Man remarks that he needs to find out what they were up to, and an indicator appears on the last goon webbed. 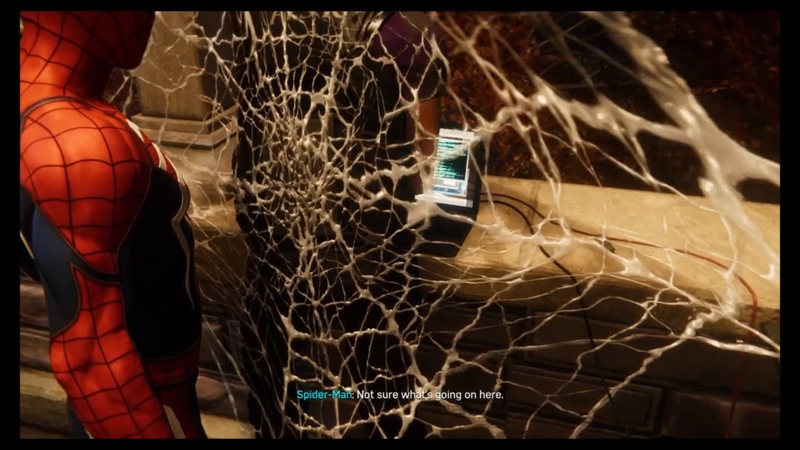 As I was playing this, I thought that Spider-Man was about to interrogate the bad guy, which seemed a little out of character for him, but instead it appeared that Spider-Man was after the laptop that the goon was using. The laptop that the goon was now webbed to. Spider-Man was audibly confused. I don't think I've laughed that hard in a good while. I can't imagine why you are so confused Spider-Man. It's not like there is anything blocking your view of the monitor or anything.